At RISD, e pluribus . . . what, exactly? 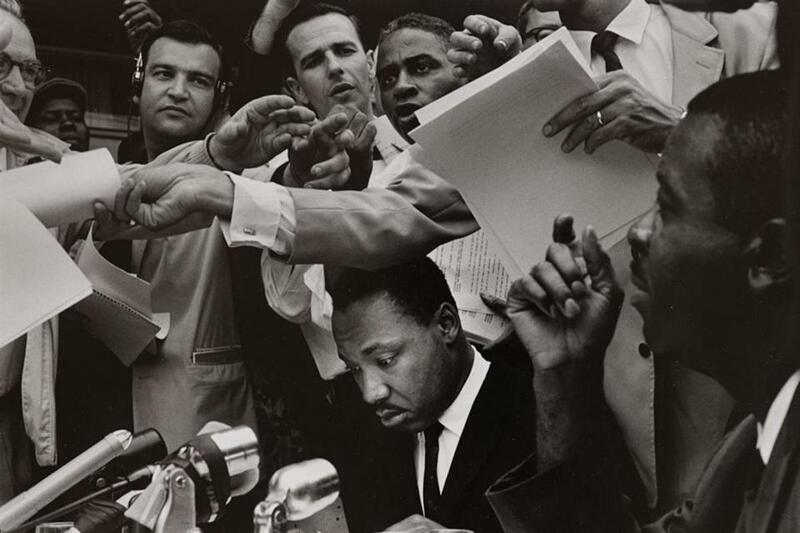 Bruce Davidson’s photograph of Martin Luther King Jr. at a 1962 press conference, in Birmingham, Ala.
PROVIDENCE — Politics and art tend to go together about as well as gunpowder and mulch. Not always, of course. Picasso’s “Guernica” looms as large over the imagination of the middle of the last century as his “Demoiselles d’Avignon” does over the imagination of its beginning. The Museum of Fine Arts may not own a greater painting than Turner’s “Slave Ship”; and anyone who thinks “Slave Ship” isn’t political art likely thinks cable news qualifies as political theory. Still, those works are exceptions, and all the more exceptional for being such mighty ones. Three shows at the Rhode Island School of Design Museum bear witness both to how reductive and self-congratulatory political art often is — as well as how effective it can be. What may be the most ideologically haunting image appears in the show that’s not ostensibly political, “Collective Recollection.” It runs through Jan. 20, as does “Former Glory,” which ruminates on the US flag. The third show, “The Phantom of Liberty: Contemporary Works in the RISD Museum Collection,” runs through Dec. 30. Is there a more loaded word politically than “liberty”? The image is a Bruce Davidson photograph of Martin Luther King Jr. Davidson took it at a 1962 press conference, in Birmingham, Ala. The location doesn’t matter. It could as easily have been some bastion of bien-pensant liberalism. What matters is the look of exhaustion and sorrow on King’s face, the way he looks trapped — by reporters, by microphones, by papers being passed, by reaching arms. A man who is almost single-handedly changing the moral grammar of an entire nation is shown not as a hero, certainly not as a villain (maybe it does matter that this is Birmingham), but as an existential prisoner. I don’t know that I’ve seen an image that communicates so clearly — or crushingly — a sense of the cost that the pursuit of righteousness can exact. “Collective Recollection” uses a wide range of photographs — photo-studio portraits, snapshots, work by photographers of the caliber of Davidson, Walker Evans, Garry Winogrand, Lewis Hine — to explore the meanings of group and individual identity. That’s a tall order for a show of barely five dozen images. Crowding them all into a single gallery is appropriate. You can feel the idea of collectivity. So many of the photographs are striking, even if the larger concept is rather muddled. Yet often muddle much better approximates reality than clarity does. Eager for clarity to emerge, we so often impose it. Muddle is no less honest intellectually than morally. One out of many, that key American concept, makes little sense without much many-ness. The great rallying symbol for Americans is the flag, Old Glory. The title of “Former Glory” indicates both the show’s subject matter and its iconoclastic stance. The two dozen works are wildly various in media, ideology, and date, covering nearly 170 years. A war bonds poster from 1918 is the height of traditionalism. Except that the patriotic citizens depicted in front of a waving Stars and Stripes are clearly, um, immigrants. What a difference a century can make, huh? Or what a difference a century and a half can fail to make. Does the “Know-Nothing Party Banner” from around 1850 represent a view that’s more traditional or contemporary? To pose the question is to answer it. The bleak wit of Brad Kayal’s screenprint “Job Creator” seems cheery by sad comparison. The Banker from Monopoly dances a jig atop the flag. How much you want to bet he gets to pass go and collect $200? Startling in a different way is Dave Cole’s “American Flag (Toy Soldiers #12).” Eighteen inches by 33 inches, it’s a sculptural rendering. The surface has such an odd texture. Look closely and you see why. The materials used are melted plastic soldiers and red, white, and blue acrylic paints. Why feel freedom, though, when you can profess cant? Bob and Roberta Smith’s “Tate Modern” is a posterish painting that bears the posterish words “The Creation Of Tate Modern Has Been As Important To British Life As The National Health Service.” The colors of the lettering are quite nice. The sentiment is up-its-own-wazoo flabbergasting. Next time you’re in Britain, if you hear, let’s say, some sick children gasping for breath, remember to tell them to take two lithographs and call a curator in the morning.